Hortus Camdenensis | Gladiolus cuspidatus Jacq. Very variable Gladiolus with sword-shaped leaves, to 75cm long, and flower stems to 80cm, bearing typically 9 flowers, to 10cm long, bell-shaped with undulate margins from a long, tapering, greenish white tube, the lobes being cream or pink, sometimes pale mauve, variously marked pink or red at the bottom. [CECB, RHSD, Hortus]. Now recognised as synonymous with Gladiolus undulatus L., which see, the latter being the valid botanical name. They are recorded as separate species in Hortus Camdenensis to both differentiate the plants grown by Macarthur and to emphasise the difference between forms recorded by early botanists. The description given here is of plants that were specifically recorded as Gladiolus cuspidatus. ‘Flowers vary much in colour and in the form of the mark on the lower segments, which is sometimes obsolete as well as the undulation. Our reasons for not having restored Linnaeus’s specific name of undulatus to this species may be seen [at] No. 538 of this work, though we now wish we had retained the trivial name of augustus, given by Thunberg for that, and Linnaeus’s name for this. The latter, in his Mantissa, fixes upon this species as the link that unites Gladiolus and Ixia, which he would hardly have done had he seen the numerous species that have been since discovered, many of which seem to approach much nearer to Ixia. This magnificent species is a native of the Cape, flowers in May and June. Our drawing was taken from the collection of Messrs. Grimwood and Wykes, at Kensington. Its time of introduction uncertain; but since the publication of Hort. Kew.’ [BM t.582/1802]. Gladiolus cuspidatus was introduced in 1796 by R. Williams, nurseryman of Turnham-Green. [ABR pl.147/1801]. This journal also figured Gladiolus cuspidatus var. 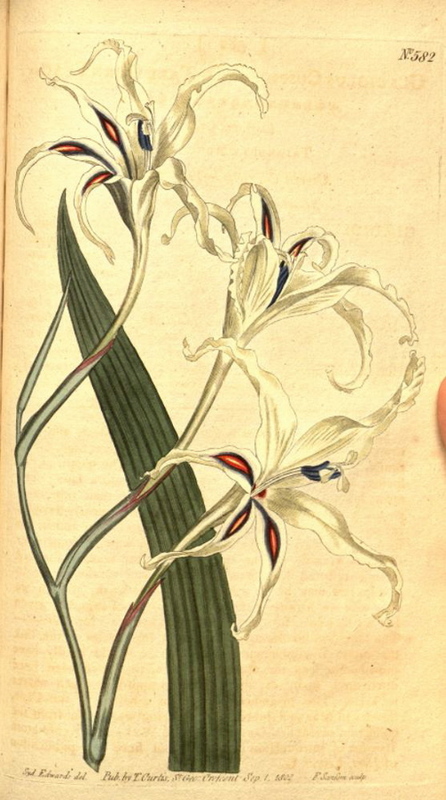 petalis crispis, with whitish flowers: ‘Although this species of gladiolus is as old in our gardens as, almost any we have; yet, it is not much known, from the infrequency of its flowers, of which there is no certainty.’ [ABR pl.219/1802]. First recorded in an Addendum to the 1843 catalogue and listed in all subsequent catalogues [B.131/1843]. Bulbs were sent to William Macleay in October of that year. [MP A2948-3]. Used extensively in hybridisation work at Camden. First appeared under the name Gladiolus undulatus in the 1845 catalogue. More details about Gladiolus cuspidatus Jacq.